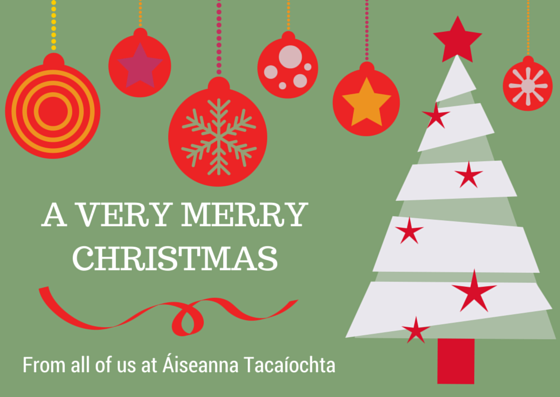 As the festive season sets well and truly in and 2014 draws to a close, all of us at Áiseanna Tacaíochta (ÁT) would like to thank everyone who has worked with and supported us over the past year. Each of us has an important part to play in making independence and equality the reality for all, and we are thrilled to be on this journey with you. 2014 has been a busy and memorable time for our organisation, as we made significant strides in moving forward and marking our place as a leading organisation in the Independent Living movement. This year has seen us increasing our membership and expanding our policies, taking on new staff to boost our capacity in supporting more people to use our innovative Direct Payments model. We’ve developed and enacted measures to strengthen our governance and accountability, ensuring that we meet high standards across everything that we do. And we’ve built deep links and forged new relationships across society, bringing everyone together in December for our first major event, Realising Equality through Active Participation. Of course, it hasn’t always been easy: we are all aware of the funding challenges facing many groups and organisations across the country, and people with disabilities still have to fight to remove barriers and change attitudes at every level, from within their own communities right up to Government. However, we are confident in our model and the positive change that it can make, so we are determined to push forward and bring our vision of a fair and equal future for everyone to life. 2015 will be the time to do that. We currently have 25 existing and incoming members; by the time I sit down to write this next year, we hope to have 50. As our membership increases, so will our impact across society, resulting in new levels of independence and freedom in people’s everyday lives, as well as leading to greater inclusion and equality in society. On top of continuing to develop our model, our work will revolve around highlighting disability as a human rights issue and ensuring that people with disabilities have access to the full set of rights that they are entitled to. This will involve changing attitudes and perceptions of disability, both within the disability movement and beyond it, to empower people with disabilities as strong, active members of society with rich life experiences and valued rights, enjoying the same opportunities as everyone else. There is nothing left for me to say other than, on behalf of everyone in our organisation, wish you and yours a very merry Christmas and a happy New Year. Enjoy the festivities and all that they bring, and we look forward to coming together with you again in 2015.